Kitchen cabinets painted with glaze and flowers. Once you are convinced that refinishing is better than replacing, you may want a few cabinet refinishing tips for how to go about it so your works look professional. All of the following tips will help you achieve professional results. If a new look is what you are after, look at magazines and the local home improvement center for ideas. You need to develop your own blueprint of ideas before you start. Kitchen cabinet refinishing can be a large project that will take time and effort. 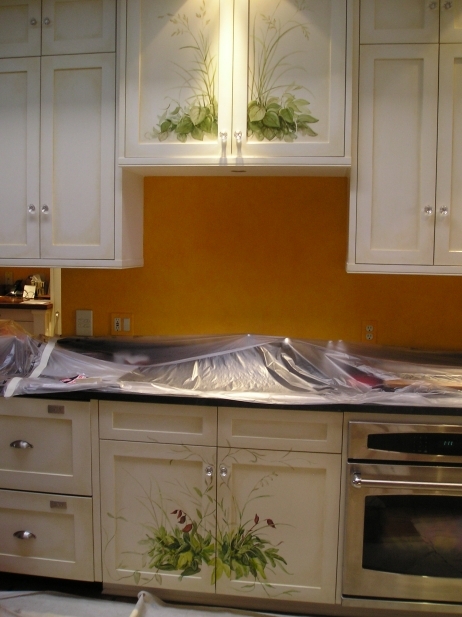 Try to set up a temporary kitchen to minimize any interference with the refinishing process. Clean, clean and clean some more. This is very crucial for the best results. Kitchens and bathrooms are difficult areas to keep clean. All soap and chemical residues or grease must be completely removed. Take everything apart that you can, labeling as you go. Remove all hinges and handles. Remove the doors and drawer fronts for easer sanding and application of the finish. Drawer fronts are often secured with a few screws to the drawer box. If your fronts cannot be removed, remove all items from the drawers and plan on refinishing with the fronts attached. Try to purchase all your materials before you start. It’s always better to have an extra quart of stain or half-gallon of paint, then to run out in the middle. There’s no guarantee you’ll get an exact match. This includes choosing an interior wood stain color and having your samples handy for comparison. Think safety first. Properly dispose of rags and cleaning chemicals. And wear the appropriate eye and lung protection. Be patient. This is a big job that takes time to do right. Don’t rush between coats of varnish or paint. Let everything dry completely. Sand lightly and wipe down between coats, especially when applying varnish. It’s only way to get a smooth, lustrous finish instead of a bumpy, amateurish look. Cabinet refinishing is far more affordable than refacing or replacing cabinets. In exchange for a lot of time yet minimal cash outlay, you can add value to your home and achieve a look that is the envy of everyone.